The TableAdapters within a Typed DataSet automatically take care of connecting to the database, issuing commands, and populating a DataTable with the results. There are occasions however when we want to take care of these details ourselves, and in this tutorial we learn how to access the database connection- and command-level settings in the TableAdapter. Throughout the tutorial series we have used Typed DataSets to implement the Data Access Layer and business objects of our layered architecture. As discussed in the first tutorial, the Typed DataSet s DataTables serve as repositories of data whereas the TableAdapters act as wrappers to communicate with the database to retrieve and modify the underlying data. The TableAdapters encapsulate the complexity involved in working with the database and saves us from having to write code to connect to the database, issue a command, or populate the results into a DataTable. There are times, however, when we need to burrow into the depths of the TableAdapter and write code that works directly with the ADO.NET objects. In the Wrapping Database Modifications within a Transaction tutorial, for example, we added methods to the TableAdapter for beginning, committing, and rolling back ADO.NET transactions. These methods used an internal, manually-created SqlTransaction object that was assigned to the TableAdapter s SqlCommand objects. In this tutorial we will examine how to access the database connection- and command-level settings in the TableAdapter. In particular, we will add functionality to the ProductsTableAdapter that enables access to the underlying connection string and command timeout settings. The Microsoft .NET Framework contains a plethora of classes designed specifically to work with data. These classes, found within the System.Data namespace, are referred to as the ADO.NET classes. Some of the classes under the ADO.NET umbrella are tied to a particular data provider. You can think of a data provider as a communication channel that allows information to flow between the ADO.NET classes and the underlying data store. There are generalized providers, like OleDb and ODBC, as well as providers that are specially designed for a particular database system. For example, while it is possible to connect to a Microsoft SQL Server database using the OleDb provider, the SqlClient provider is much more efficient as it was designed and optimized specifically for SQL Server. For SELECT queries, work with the resulting records. There are separate ADO.NET classes for performing each of these steps. To connect to a database using the SqlClient provider, for example, use the SqlConnection class. To issue an INSERT, UPDATE, DELETE, or SELECT command to the database, use the SqlCommand class. Except for the Wrapping Database Modifications within a Transaction tutorial, we have not had to write any low-level ADO.NET code ourselves because the TableAdapters auto-generated code includes the functionality needed to connect to the database, issue commands, retrieve data, and populate that data into DataTables. However, there may be times when we need to customize these low-level settings. Over the next few steps we will examine how to tap into the ADO.NET objects used internally by the TableAdapters. Each TableAdapter class has a Connection property that specifies database connection information. This property s data type and ConnectionString value are determined by the selections made in the TableAdapter Configuration wizard. Recall that when we first add a TableAdapter to a Typed DataSet this wizard asks us for the database source (see Figure 1). 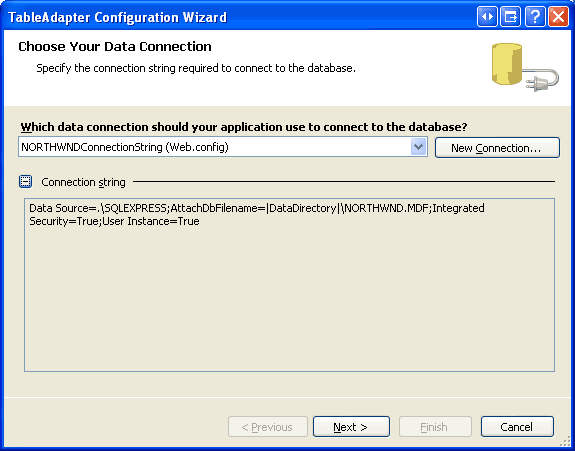 The drop-down list in this first step includes those databases specified in the configuration file as well as any other databases in the Server Explorer s Data Connections. If the database we want to use does not exist in the drop-down list, a new database connection can be specified by clicking the New Connection button and providing the needed connection information. Let s take a moment to inspect the code for the TableAdapter s Connection property. As noted in the Creating a Data Access Layer tutorial, we can view the auto-generated TableAdapter code by going to the Class View window, drilling down to the appropriate class, and then double-clicking the member name. Navigate to the Class View window by going to the View menu and choosing Class View (or by typing Ctrl+Shift+C). From the top half of the Class View window, drill down to the NorthwindTableAdapters namespace and select the ProductsTableAdapter class. This will display the ProductsTableAdapter s members in the bottom half of the Class View, as shown in Figure 2. Double-click the Connection property to see its code. When the TableAdapter class is instantiated, the member variable _connection is equal to Nothing. When the Connection property is accessed, it first checks to see if the _connection member variable has been instantiated. 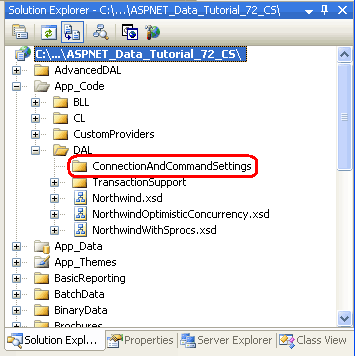 If it has not, the InitConnection method is invoked, which instantiates _connection and sets its ConnectionString property to the connection string value specified from the TableAdapter Configuration wizard s first step. The Connection property can also be assigned to a SqlConnection object. Doing so associates the new SqlConnection object with each of the TableAdapter s SqlCommand objects. The connection information should remain encapsulated within the TableAdapter and not be accessible to other layers in the application architecture. 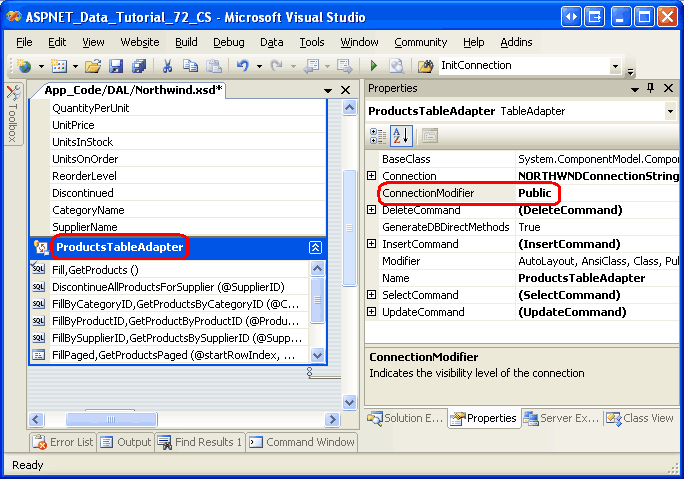 However, there may be scenarios when the TableAdapter s connection-level information needs to be accessible or customizable for a query, user, or ASP.NET page. Let s extend the ProductsTableAdapter in the Northwind DataSet to include a ConnectionString property that can be used by the Business Logic Layer to read or change the connection string used by the TableAdapter. A connection string is a string that specifies database connection information, such as the provider to use, the location of the database, authentication credentials, and other database-related settings. For a list of connection string patterns used by a variety of data stores and providers, see ConnectionStrings.com. As discussed in the Creating a Data Access Layer tutorial, the Typed DataSet s auto-generated classes can be extended through the use of partial classes. First, create a new subfolder in the project named ConnectionAndCommandSettings underneath the ~/App_Code/DAL folder. This partial class adds a Public property named ConnectionString to the ProductsTableAdapter class that allows any layer to read or update the connection string for the TableAdapter s underlying connection. With this partial class created (and saved), open the ProductsBLL class. Go to one of the existing methods and type in Adapter and then hit the period key to bring up IntelliSense. You should see the new ConnectionString property available in IntelliSense, meaning that you can programmatically read or adjust this value from the BLL. This partial class exposes just one property of the underlying connection object: ConnectionString. If you want to make the entire connection object available beyond the confines of the TableAdapter, you can alternatively change the Connection property s protection level. The auto-generated code we examined in Step 1 showed that the TableAdapter s Connection property is marked as Friend, meaning that it can only be accessed by classes in the same assembly. This can be changed, however, via the TableAdapter s ConnectionModifier property. Open the Northwind DataSet, click on the ProductsTableAdapter in the Designer, and navigate to the Properties window. There you will see the ConnectionModifier set to its default value, Assembly. To make the Connection property available outside of the Typed DataSet s assembly, change the ConnectionModifier property to Public. Save the DataSet and then return to the ProductsBLL class. As before, go to one of the existing methods and type in Adapter and then hit the period key to bring up IntelliSense. The list should include a Connection property, meaning that you can now programmatically read or assign any connection-level settings from the BLL. A TableAdapter consists of a main query that, by default, has auto-generated INSERT, UPDATE, and DELETE statements. 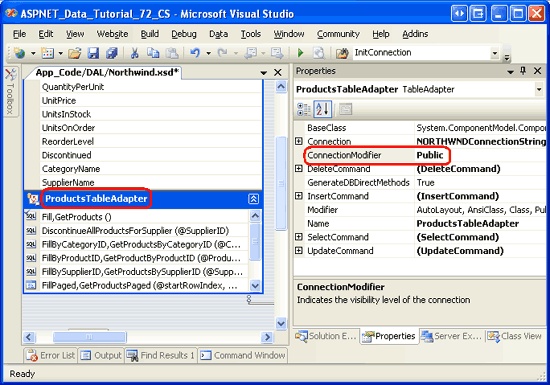 This main query s INSERT, UPDATE, and DELETE statements are implemented in the TableAdapter s code as an ADO.NET data adapter object via the Adapter property. Like with its Connection property, the Adapter property s data type is determined by the data provider used. Since these tutorials use the SqlClient provider, the Adapter property is of type SqlDataAdapter. A SqlCommand object is responsible for sending a particular query to the database and has properties like: CommandText, which contains the ad-hoc SQL statement or stored procedure to execute; and Parameters, which is a collection of SqlParameter objects. As we saw back in the Creating a Data Access Layer tutorial, these command objects can be customized through the Properties window. In addition to its main query, the TableAdapter can include a variable number of methods that, when invoked, dispatch a specified command to the database. The main query s command object and the command objects for all additional methods are stored in the TableAdapter s CommandCollection property. The code for the Adapter and CommandCollection properties closely mimics that of the Connection property. There are member variables that hold the objects used by the properties. The properties Get accessors start by checking to see if the corresponding member variable is Nothing. If so, an initialization method is called which creates an instance of the member variable and assigns the core command-related properties. Ideally, the command-level information should remain encapsulated within the Data Access Layer. Should this information be needed in other layers of the architecture, however, it can be exposed through a partial class, just like with the connection-level settings. Since the TableAdapter only has a single Connection property, the code for exposing connection-level settings is fairly straightforward. Things are a bit more complicated when modifying command-level settings because the TableAdapter can have multiple command objects - an InsertCommand, UpdateCommand, and DeleteCommand, along with a variable number of command objects in the CommandCollection property. When updating command-level settings, these settings will need to be propagated to all of the command objects. For example, imagine that there were certain queries in the TableAdapter that took an extraordinary long time to execute. When using the TableAdapter to execute one of those queries, we might want to increase the command object s CommandTimeout property. This property specifies the number of seconds to wait for the command to execute and defaults to 30. This method could be invoked from the BLL or Presentation Layer to set the command timeout for all commands issues by that TableAdapter instance. The Adapter and CommandCollection properties are marked as Private, meaning they can only be accessed from code within the TableAdapter. Unlike the Connection property, these access modifiers are not configurable. Therefore, if you need to expose command-level properties to other layers in the architecture you must use the partial class approach discussed above to provide a Public method or property that reads or writes to the Private command objects. The TableAdapters within a Typed DataSet serve to encapsulate data access details and complexity. Using TableAdapters, we do not have to worry about writing ADO.NET code to connect to the database, issue a command, or populate the results into a DataTable. It is all handled automatically for us. However, there may be times when we need to customize the low-level ADO.NET specifics, such as changing the connection string or the default connection or command timeout values. The TableAdapter has auto-generated Connection, Adapter, and CommandCollection properties, but these are either Friend or Private, by default. This internal information can be exposed by extending the TableAdapter using partial classes to include Public methods or properties. Alternatively, the TableAdapter s Connection property access modifier can be configured through the TableAdapter s ConnectionModifier property. This tutorial series was reviewed by many helpful reviewers. Lead reviewers for this tutorial were Burnadette Leigh, S ren Jacob Lauritsen, Teresa Murphy, and Hilton Geisenow. Interested in reviewing my upcoming MSDN articles? If so, drop me a line at mitchell@4GuysFromRolla.com.